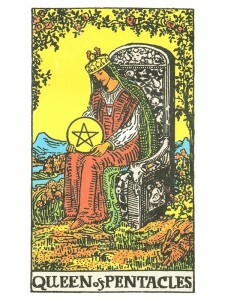 Queen of Pentacles shares mastery of building new and fulfilling worlds by nurturing the creative aspects of life. A talented energy – family oriented and charitable. She possess a great business intellect which is not afraid of hard work. She tends to become despondent at times, retiring inward for rejuvenation – but, over all she is able to use her talent well and be happy at work or at home. She possesses the finest of the “quieter” qualities – greatness of heart, strong intuition and instinct. She is a quiet, hard working, practical, sensible person – fully aware of her “inner” self. She knows and believes in herself and the magic of her life – having joined forces with the Universe – allowing it to flow through her into her daily life. Dependable, resourceful, can-doer. Watchful, very generous, good instincts – a good physical leader. Great endurance, ruled by the drive of the heart. Mother/provider, mother earth, naturalist – concern for physical health and the safety of the family. Nourishment. Channel for practical information. How are you channeling your physical resources? Who inspires your need for practical skills and nurtures your desire for knowledge? Who is reliable and trustworthy? How are you grounded in Mother Earth? In the first position: This is the energy that runs through this lifetime for you and will see you working steadily for as much and as long as it takes to get things done. You are keenly sensitive to the rhythms of nature, that things must be done in their season and on time or there will be no harvest. In the second position: A family member or someone you can fall back on. It can also suggest that you have very basic, healthy processes and instincts that serve you well. You are in harmony with your surroundings and should have many a safe harbor if you need it. In the third position: Think well on this card for she is coming to you in one guise or another. As a guide and source of inspiration, she is directing your attention to your physical/ material house, that you may increase the efficiency there. In the fourth position: Here is the sort of passion that might fill the heart of a young rural girl or boy in the Future Farmers of America, with a prize winning lamb in the county fair or of the city boy or girl with a prize winning experiment at the science fair. Here is a love for how things live and work. This may also be a mother figure, real or idealized. In the fifth position: Your mind is on this queen. She may represent a rise in consciousness for the Physical Plane and its programs, such as environmental awareness or concern for health, diet, exercise. In the sixth position: This queen is on your emotional horizon in the near future. If she is not presenting herself in person, then earthly matters are pulling at your heart. How are you and your extended family of loved ones relating to your surroundings, to nature? In the seventh position: This queen is on your mental horizon in the near future. If she is not presenting herself in person, then the archetype is demanding attention to her programs. It is important to the realization of your goals that you integrate more of her principles into your work. In the eighth position: The queen is in your house and can make a house a home full of health and vitality and good things to eat. In the ninth position: Your heart is on this queen. She may be an object of your affection or the centerpiece of a creative project underway. Her programs may dominate your feelings. In the tenth position: Here is the support, the energy and resources that you need to enhance your Physical/material Plane and it may well come in the physical personage of the Queen of Pentacles. It may however, be the access to what she represents. Here are resources and replenishment for your basic needs.